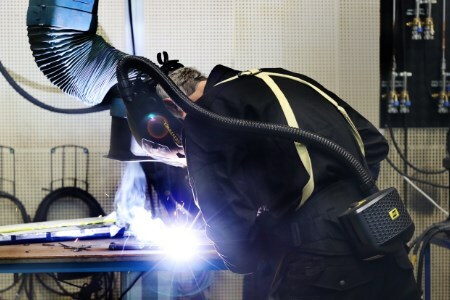 ESAB Welding and Cutting has long been a health and safety pioneer, producing PPE which optimises the removal of welding fumes to ensure a safe environment for all operators. Among the many products ESAB supplies are the Sentinel™ A50 and Sentinel A50 Air high-performance automatic welding helmets. The latter of which incorporates a powered air purifying respirator (PAPR) unit. The Sentinel’s radical design incorporates ergonomic headgear and maximum adjustability to increase productivity, functionality and usability. The Sentinel A50’s high-tech features include an almost infinitely adjustable 5-point headgear, a 100 x 60 mm viewing area, an externally activated grind button, a colour touch screen control panel and a front-loading convex cover lens that comes in different colour options and changes in 10 seconds. ESAB also supplies the F&G range of helmets which consists of the F20, G30, G40 and G50 models which are suited to welding, cutting and grinding applications with their flip-up visor design. From the simplicity and high protection level of the F20 to the versatility of the G30 and the large inner visors of the G40 and G50, the F&G range is ESAB’s most versatile welding and grinding helmet solution. To complement the helmet portfolio is the PAPR, which features a P3 filter and pre-filter to remove particulates and the latest control technology, allowing the operator to adjust air flow between 170 and 220 l./min. to suit the environment and application. As an extra measure of safety, it incorporates both visual and audible alarms to alert the operator in the event of a blocked filter or low battery. Compatible helmets include the SENTINEL A50 for Air, G30 Air, G40 Air and G50 Air and Warrior™ Tech. Designed with robust construction for all heavy-duty welding applications, the ESAB PAPR weighs a comfortable 1 kg. A Li-Ion battery pack provides up to 8 hr operation at an air flow rate 220 l./min., and an LED indicator makes it easy for operators to see and set flowrates; there is also an LED indicator for battery charge. For ‘at source’ source extraction, ESAB supplies the Carryvac 2 P150/P150 AST machines; two small, lightweight, portable extraction units which can be carried into the working area. Connected to a welding torch or to an extraction nozzle, these units extract the fumes directly. For light to medium welding and extraction applications, ESAB supplies the Origo Vac Carts which can be supplied with or without a light and are simple and easy to use portable units. PSF Centrovac Welding Torches boast integrated smoke extraction which provides a smoke-free working environment for the welder. The handles are ergonomically designed and incorporate a reduction valve for suction adjustment. Alongside these welding torches, there is a range of fume extraction torches available from TBi. ESAB has a wealth of experience in PPE and a broad range of products suitable for use by operators involved in welding, cutting and other operations.